Rebecca Palacios and I just finished hosting the first iteration of “Pixelles” Montreal, a six-week course that helped a handful of women become first-time game makers. Hopefully they will continue to practice this new craft, and inspire others to do the same. Rebecca herself is a graduate of a similar program, proving its potential for pay-it-forward viral effects. 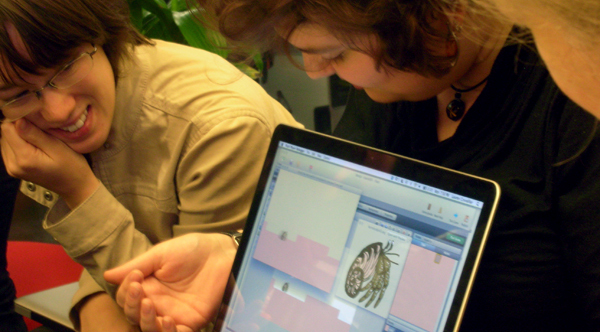 The goal for us was to increase the diversity of people who make games, on a grass-roots level. Although it lacks any commercial ambitions, some call it an ‘incubator’ because it is intended to be a nurturing environment for otherwise unlikely games. We focused on women because it’s our particular interest, and the interest of our funding source, but whether you’re interested in increasing the diversity of game creator race, sexual orientation, whatever, this workshop series format could work for you and your community. It’s pretty simple. Please note: I came up with neither the idea nor the implementation! The good folks over at the Hand Eye Society ran the first such workshop series (the “Difference Engine Initiative”), funded by Feminists in Games. We based almost everything we did on their templates. You can read more about their passion and purpose in a previous Gamasutra interview. The amazing thing about this program, to me, is that it comes incredibly cheap by charitable standards. We’re in the beginning of a bright new era in which game-making tools come by the dozen, usable by anyone with a computer, no technical experience required. As a result, you don’t need much. You’ll need one or two passionate people who are willing to give a few hours a week for a few months, and a couple thousand dollars. Each participant will also need access to a computer with an internet connection -- personal laptops are ideal, but not necessary. Ready? Six weeks from start to finish. No previous technical experience required. Each participant mades one game each, whatever game they wanted to make. We encouraged 2D games for ease of use, but we also supported 3D/Unity games for those that wanted it (2 did). We met once a week for 3 hours, and had workspace available for use 24/7. We provided (in descending order of importance) deadlines, guidance to resources, and a place to work. We explicitly did NOT use a classroom setup. Each participant was informed early and often that it was THEIR responsibility to be proactive and find tutorials, learn their tool, fix their bugs, and make their game themselves. If they didn’t do the “homework” or missed a meeting, they might receive a bit of playful scolding, but it was their own loss. Our role as coordinators was to encourage and provide helpful materials, not to teach. You can also play their games! We did it on the cheap! This is the budget we worked with, kindly provided by Feminists in Games. * Honorarium: It’s tempting to think “I’m willing to do this for free! I don’t need to be paid, and neither should any other passionate coordinator!” However, you and everyone else are much more likely to take their responsibilities seriously when paid even a nominal amount. It creates the mindset of an employee, instead of a volunteer. 1 - Is she a female that has not made a game before? 2 - Do we think she can finish a semi-grueling six-week project? 3 - Select as many differently-interested women we can, so that we end up with as wide a variety of games made as possible. The original “Difference Engine Initiative” supported 6 participants. We chose to accept 10 participants because our facilities would support it without any added expense. However, we felt this was the maximum number that would still offer a personalised experience. Aside from basic contact information, we primarily asked about their favorite games to play and any “crazy” game ideas they’ve had. Note that we explicitly did *not* discriminate based on intention to join the games industry, technical experience, race, charisma, socio-economic status, native language, etc. We simply wanted 10 very different women with 10 different passions, who we could be reasonably sure would all finish what they start. It worked! We ended up with quite a variety of games, from platformers to puzzlers to arty educational experiences. We also happened to choose a good mix of ethnicities and nationalities, as an accidental bonus. Towards the end of the six weeks, it was increasingly beneficial for the participants to have time allotted during meetings for knowledge transfer. One participant had an unlockable door working and the other struggled for some time to solve the same problem. If she hadn’t been able to solve it, the game would need massive re-designs. Luckily, they managed to help each other before the end; all of the internet forums and distant experts won’t help as much as someone over your shoulder just looking at what’s going on, even if that person isn’t much more experienced than yourself. We had so much interest and so many applicants we had to disappoint, Rebecca came up with the idea of creating a sign-up for people who wanted to follow along from home. We would blog our progress/resources/focus and email out the homework assignments. Follow-Alongs wouldn’t have access to the meetings or the workspace, but they could still follow the deadlines and hopefully make a game. It was something of an experiment, but it worked better than we expected. Out of the 30+ Follow Along signups, 4 successfully made a game during that time. We recognised their extreme dedication by displaying their games alongside “normal” Pixelles participants at the final Showcase. Montreal happens to be rich with game-making studios and professionals, so it wasn’t particularly difficult for us to find 6+ women of varying expertise who were not just willing but excited to come in and speak to the Pixelles participants. They described their experience making games, a bit about what they particularly specialise in and are passionate about, then took questions. Feedback from the participants was very positive. In less studio-rich settings, video-conferencing might have been a more feasible option. In the future, we’d like the mentors to actually teach a small part of their skills to the participants, not just serve as inspirational role models. One of the mentors, the irrepressible Stephanie Bouchard, works part-time as a professor of game design and her contribution of “Game Design 101” slides was warmly received. Playtesting was another “best design practices” implementation that seemed to help the participants. We brought in a handful of people who had never seen or heard about the game ideas before and had them sit down, without allowing the participants to defend or explain their game, or correct playtesters’ mistaken behaviors. As always, this was extremely useful, even if we had to inflict it on the playtesters slightly before they felt “ready” for it. SNACKS! We met on a weekday from 6 to 9pm, and although some people brought a microwaveable dinner, most chose to eat afterwards. If we hadn’t provided a decent array of crudités, chips, cookies, cheese, chocolate, etc, everyone would have been much more impatient, grumpy, and generally less productive. Funcom Games Canada kindly allowed us to use part of their office, one of their meeting rooms once a week, and also lent us 3 desktop computers for participants who did not have laptops. We could potentially have used the facilities at an art-community studio or a university technology lab, but we think that the game development surroundings added to the sense of responsibility and professionalism throughout the program. We didn’t utilise it as much as we could have, but Twitter was both an easy-to-use PR platform and a community builder. Both the Pixelles and Follow Along folks could keep us and post encouraging updates on their progress all throughout the program, especially outside normal meeting times. We will probably use it more next time, if the program is repeated. Some of the participants had practiced programming previously, but most had not. No technical experience was required to be accepted, and the tools we suggested were mostly visual. However, without an understanding of concepts like if statements, global variables, and other fundamental logic structures, some participants’ progress was massively slowed. We could have offered some optional resources for the participants to do some basic code exercises, or even included a small amount of actual teaching in one of the early meetings. It’s tough to have any leverage with volunteers on a weekday evening, but it was really unfortunate that a few of our mentors couldn’t come to meetings that they signed up for. Maybe we could add pressure by profiling them on the blog beforehand, making it feel more official and beneficial to their visibility. Initially, when recruiting applicants, we advertised “4 hours a week” as the weekly time commitment, not including meetings. This was reported as being quite low, compared to the actual amount of time most participants felt obliged to spend in order to complete their homework and game to a minimum acceptable quality. It might have been more honest to say 6 or 8 hours a week should be expected, outside the meeting. Because we based our Follow-Along signups on the rejected applicants, we naturally created an all-female mailing list, which wasn’t really necessary. There’s no reason to ever restrict resources and inspiration from someone who wants to make a game; in the future, we will allow anyone at all to sign up for Follow-Along updates, deadline notifications, and encouragement. Pixelles Montreal met or exceeded all of our goals. As such, we consider it a great success. Due to the overwhelming interest in the first series, we find it likely that we will hold second and third series. This workshop series format, or some variant, should be a standard in all major cities, perhaps on an annual basis, for all under-represented groups in the game-making medium. Everyone draws pictures or writes poems and stories in elementary school, and most people make films in high school. I believe humanity would benefit from everyone also making games as a normal part of their lives, whether or not they are interested in joining the industry. Anyone interested in hosting their own such series is absolutely welcome to contact me or Rebecca at any time. We are willing to share our application materials, curriculum, and even more nitty-gritty advice to help you make this happen. Good luck!